Mom, Mommy, Mami, Mama. No matter how you call your mother, she'll be thrilled to receive our colorful stripped Marvelous Mom Goodie Tin. 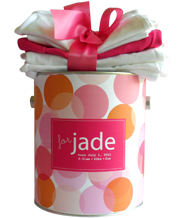 This personalized Mother's Day gift Goodie Tin is filled with 24 beautiful pink roses. This Goodie Tin becomes a cute Mother's Day gift and personal gift when personalized with your favorite photo of Mom. Fully wrapped and ready to gift. Goodie Tins, the more sophisticated cousin of the gift basket..